Mohave Valley & Needles Area! We’re just five minutes from Avi Casino and only 15 minutes from the great casinos in downtown Laughlin, NV. If you like water sports such as kayaking, fishing, boating & wake-boarding, we’re one short mile from the Colorado River. You’ll love the “wild” burros in historic Oatman, AZ, an authentic western ghost town and mining camp, just 13 miles away. And if you like to golf, there are a lot of public golf courses nearby for your enjoyment. 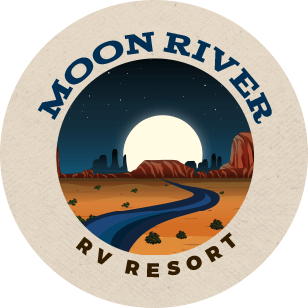 Moon River RV Resort is surrounded by exiting things to do. To sort through the many options, we’ve put together some of the best to help you plan your Southwest desert RV vacation. If water sports like kayaking, fishing, boating & wake-boarding are your favorite pastimes, you’ll love how close we are to the beautiful Colorado River! Good Sam didn’t rate us so highly for nothing! From our free Wi-Fi, beautiful heated pool, large clubhouse, immaculate restrooms & showers and modern laundry facility to our oversize 30/50-amp full hook-up “Big Rig” pull-through & back-in sites, our facilities are tops! We even offer a convenience store & gift shop right here on-site!